In 1871, a serious fire swept through Rolleston Hall, which was undergoing major renovation at the time. It caused significant damage and at one point, even looked as though the entire hall could be completely lost. A disastrous fire broke out early on Thursday morning, at Rolleston Hall, the seat of the Mosley family, which for a time, threatened to demolish the whole of the building. The hall, has since the death of the late Sir Oswald Mosley, Bart, been undergoing considerable renovation, and a new wing was being added, previously to the present Baronet, Sir Tonman Mosley, entering upon it. A considerable number of workmen were therefore employed at the hall, but at the time the fire broke out it was only tenanted by two domestics, the butler and his wife. How the fire originated is not definitely known, and it seems likely to remain a mystery, the over-heating of the rooms, caused through airing, preparatory to their being tenanted being generally assigned as the cause. The Hall is situated about four miles from Burton and about a quarter of a mile from the village of Rolleston. It is an old baronial residence, picturesquely situated in the valley of the Dove, and surrounded by a number of fine old trees. It has an extensive frontage to the south and west, and this front comprises a suite of elegantly-furnished rooms, hung with a large number of fine old paintings, many of which are of great value. The late Sir Oswald’s extensive library was also in this portion of the house, and here might be found an immense number of very rare and choice works, both scientifical, historical, biographical, and religious, besides numerous miscellaneous volumes. The fire was first discovered about five o’clock, and a messenger was immediately dispatched to Burton for assistance. The two town engines, and Messrs. Bass and Co.’s and Messrs. Allsopp and Sons’ engines were quickly en route for the scene of the conflagration, where hundreds of willing hands from Rolleston and the neighbouring villages were busily engaged in trying to stop the progress of the flames. Fortunately, there was an excellent supply of water at hand from a neighbouring fishpond. After a few hours’ hard work the progress of the flames was arrested, and the fire to a certain extent got under. The furniture, paintings, and books were, with great effort, saved, with but little injury; but the butler’s pantry suffered considerably, and a quantity of plate was melted. The whole of that part of the building where the fire originated was completely guttered, owing to the walls being composed partly of timber; and so destructive were the flames, that the roof fell in with a terrible crash. The new wing which is being erected was fortunately saved, as well as the back part of the house. Supt. Oswell, with a body of police from Burton, were soon on the spot, and rendered great assistance in organising the staff of workers. We hear that the whole of the injured property is covered by insurance. 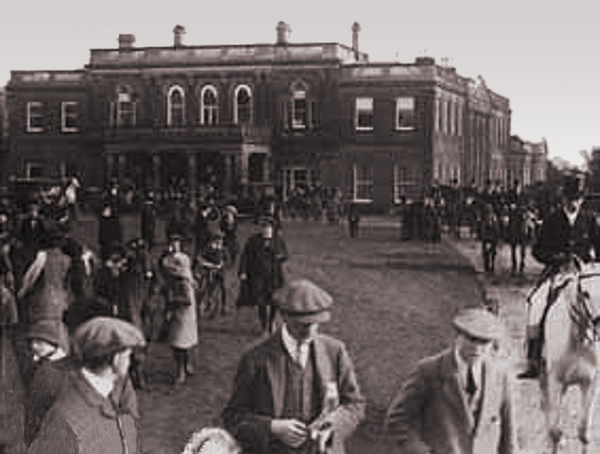 The above photo was taken the year after the great fire with the Mosely family very relieved to be able to demonstrate that the fully repaired hall remained a central part of the local community.